Algol – perhaps the most famous variable star in all the heavens – will be dimmest tonight at 8:29 p.m. Mountain Standard Time. Even at its dimmest, Algol is still bright enough to see with the eye. Algol is what astronomers call an eclipsing binary star. In other words, the single point of light that we see as Algol is really two stars. Like clockwork, these two stars revolve around each other every 2.87 days. When the dimmer of these two stars moves in front of the brighter, Algol exhibits its minimum brightness. That is why Algol is so famous. It is easy to watch – over the short span of a few days – as this star brightens and dims. The next minimum will fall on December 8, at 6:18 p.m. Central Time. To notice the change in Algol’s brightness, try contrasting it with a nearby star. Algol is part of the constellation Perseus the Hero. The ancient Greeks saw Algol as the head of the Medusa, a frightful monster with a head full of snakes in place of hair. According to myth, anyone looking at the Medusa would turn into stone. It has even said that sea plants turned into coral when they happened to glance in the direction of the fearsome Medusa. In the myths, Perseus was able to kill Medusa as he viewed her reflection in a polished shield. The name Algol means The Ghoul, and the star is sometimes called Demon Star. Early skywatchers likely noticed the variable brightness of Algol, associating the evil wink of this Demon Star with the baleful stare of the legendary Medusa. How can you find Algol? 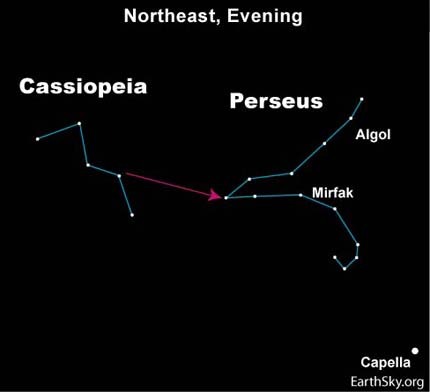 Notice the easy-to-recognize M-shape of the constellation Cassiopeia shining high in your northern sky on December evenings. Then if you can star-hop from there to Algol, one of the sky’s most famous variable stars. Site contents copyright © 2019 Recorder Online	except as noted. All rights reserved. | 83 queries in 1.099 seconds.